Does the prospect of traveling with baby give you heart palpitations? Do you imagine all the many ways it can go wrong? We hear you. We feel you. And, we've been there. Here are our tried and true tips and must-haves to keep your sanity in check. Whatever your travel plans are, you need to consider the ages and stages of all your kids and what their needs will be throughout the duration of the trip. Will you have to get up and pace with your baby on the plane? Best to get an aisle seat then. If you're taking a road trip, map out your stops with your kids in mind – food, naps, and play breaks. Picture this, you're climbing to 30,000 feet and your little one has a blowout all over your lap. Good times, right? Even better if you came prepared with a lap pad, plenty of wipes, a change of clothes for baby and yourself in the event your lap pad failed you. 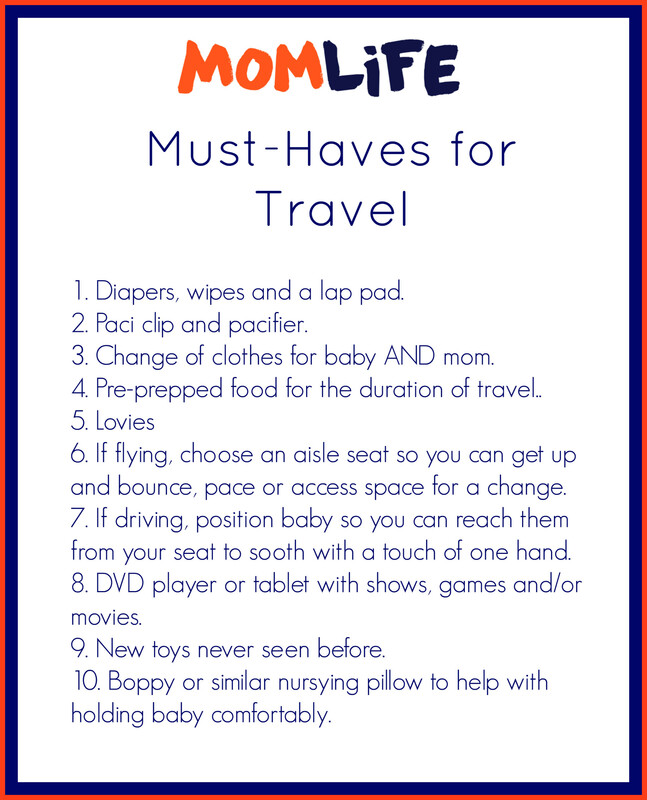 Travel + hanger = an inconsolable baby, so don't let it happen. Bring more food than you anticipate needing, and if you're flying, feed baby milk when going up and when going back down. The sucking motion will help with the pressure that often causes babies so much discomfort. This is the one time you do not want to forget your child's favorite blankie, or their pacifier if they can't live without them when sleeping or in need of soothing. Also, do not underestimate the sheer number of wipes you will need. There is no such thing as too many. Finally, for your littlest babies, consider bringing your Bobby pillow or carrier for more comfortable holding and nursing on travel. Make sure to have some tricks to try while on travel – favorite snacks to break out as a distraction from frustration, a couple of new toys to play with, and if your kids love a specific show, get a new episode or three on DVD. Below is a handy checklist to keep you on track. What would you add to this list? Hop into the mom.life app and share your tips and tricks with fellow moms like you!